Jobu says goodbye to Yankees legend Jorge Posada, who announced that he intends to retire from professional baseball. The Yankees world got some bittersweet news this weekend when Jorge Posada decided to hang up his “tools of ignorance”, as writer Jim Williams famously called them in his 1944 Sporting News article. It was bittersweet because, on the one hand, we say goodbye to one of the “core four”, a group that helped us be a part of five World Championships. As sad as that is, the good thing is that we won’t have to see him come back to the stadium as a visiting player for the Royals, or somewhere else he would look foolish. Jorge chose the right time to hang them up, and he can walk away with his head held high. Jorge Posada will always be a Yankee, and his retirement ensures that we, as fans, will never have to share our memories of Jorge with any other franchise. He Chose the perfect time to walk away. While the beginning of 2011 was a horrible struggle for Jorge that was marred by the now infamous “batting 9th” incident, he put it together in the second half of the year and ended up being a positive contributor to the Yankees 97 win season. He even led the team in hitting in their ALDS loss to the Detroit Tigers, showing that he may have lost a step or two, but he didn’t lose his ability to hit in the clutch. What will I remember most about Jorge? That’s tough to say. My friends and I still laugh at the fact that his first in-game action came as a pinch runner in a blowout win against the Mariners. Jorge pinch running? Had the Yankees used all their available turtles earlier in the game? My mind next goes to him catching David Wells’ perfect game in 1998 and thinking that he had finally arrived as a catcher (I feel like the catcher should get his share of the credit in a perfect game too). For a twenty-six-year-old first year starter to be able to call a perfect game like that (Wells said he barely shook Posada off that game) is very impressive. Jorge didn’t become overwhelmed or get caught up in the moment. He just let Wells work his magic that day. If not the Hall of Fame, will this be Jorge’s next stop? My next memory happened in 2003. The Yankees were on the brink of elimination, and down 5-3 to Pedro Martinez and the Sox in the 8th inning of game seven of the ALCS. I was watching the game in my Boston College dorm room, surrounded by gushing Red Sox fans who were already buying they’re “At Least We Beat the Yankees” t-shirts. I remember that rally. I kept my hat over my face, barely peering out from under the brim because I couldn’t watch. I don’t think I ever thought the Yankees would lose that game, but it was getting pretty hairy. Thats when Jorge stepped up to the plate with Matsui on second and Bernie Williams on third. I wish I could say Jorge came up and hit a 450-foot home run into the upper deck to give the Yankees the lead. He didn’t. Instead, he hit a bloop double to short center field. It was more than enough. Matsui and Williams scored, the game was tied, and it set the stage for Aaron Boone’s heroics and a 6-5 Yankees win just three innings later. 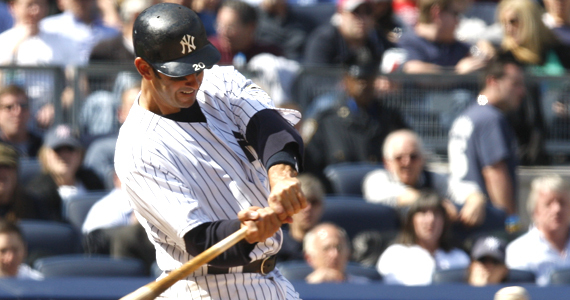 This will always be my fondest memory of Jorge Posada. In 2011, the fact that his play was declining was pretty obvious, but he still managed to thrill me a couple of times while I was at the stadium in person. On April 14th, against the Orioles, he led off the bottom of the 9th with a solo home run. It too completed a big comeback, and the Yankees eventually won that game 6-5 as well. In August, I went to the Stadium to watch what was Jorge’s first start since he asked out of the lineup against the Red Sox the week before. Jorge took full advantage of his playing time against the Rays that day, and showed Joe Girardi that he could still contribute. He knocked three hits in that game, including a two-run single in the second inning and a monster Grand Slam in the fifth. He still had a little gas left in the tank, afterall. His most important hit of the season, however, came in late September. His eighth inning single against (again) the Rays drove in the run that would clinch the AL East for the Yankees. As we said before, Jorge led the team in hitting in the playoffs, which was a fitting way to close out a career. The unavoidable Hall of Fame debate has already begun for Jorge, especially now that another Yankee great, Bernie Williams, didn’t get voted in this year. Is Posada HOF worthy? We covered that a bit a couple of weeks ago when I compared his career to that of another great catcher, Jason Varitek. Posada’s numbers don’t stand out when compared to most HOFers, unless you start comparing him to catchers and, more specifically, catchers of his era. In his prime (2000-2009), I can’t name more than a couple guys who were better than Jorge. Ivan Rodriguez, Mike Piazza are both obvious HOFers, and I’m not counting guys like McCann and Mauer because they were starting when Posada was finishing. Other than that, is there anyone else you’d place ahead of Jorge (at least offensively)? Jorge had eight seasons of 20 or more home runs, and eight seasons of 80 or more RBI. He also won five silver slugger awards, made five all-star teams and (most importantly) owns five World Series rings (admittedly he really only contributed to four of those). Does he belong in the HOF? I can’t say for sure, but it wouldn’t be the craziest thing I ever saw. 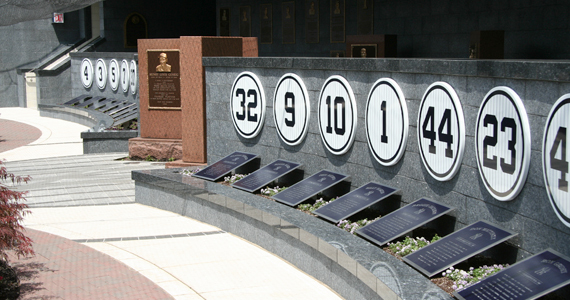 At least we know he’ll end up with a plaque in Monument Park (Jeter and Rivera get full Monuments) and maybe a retired number too. We will miss you Jorge, I can’t wait to see you sock some dingers at Old Timer’s Day too! My strongest memory of Jorge will always be his reaction right after he just missed throwing out Dave Roberts stealing second base back in ’04 playoffs. Seriously, as a Red Sox fan it’s a relief to see him finally hanging up the spikes. It seems like no matter how he was doing against the rest of the league, he almost always found ways of sticking it to the Sox. I think retiring as a Yankee is the classy thing to do, as well. Knowing when and how to call it quits is a talent most pro athletes seem to lack. Enjoy, retirement Jorge. Being able to retire at a relatively young age is a gift.